The prices in this deal round up were accurate as of 2019-04-14 11:36 EST. The prices may have changed since then. 57% OFF Fahrenheat FUH724 7500W GARAGE HEATER: You can get this for only $199.99 here and it’s normally $471.00 at Amazon. 62% OFF Insignia – 11.4″ Electric Induction Cooktop: You can get this for only $29.99 here and it’s normally $79.99 at Best Buy. 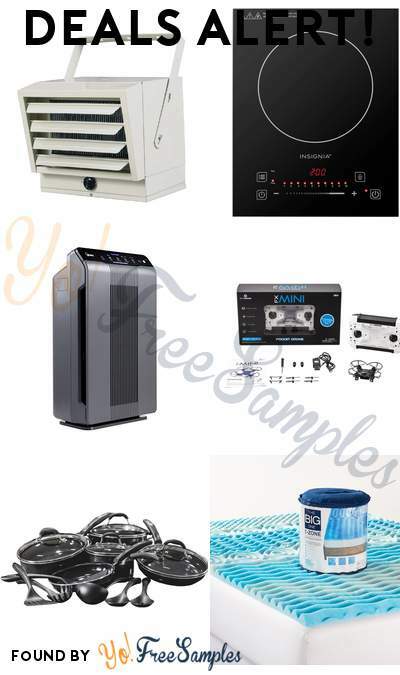 42% OFF Winix 5300-2 Air Purifier with True HEPA, PlasmaWave and Odor Reducing Carbon Filter: You can get this for only $115.99 here and it’s normally $199.99 at Amazon. 66% OFF SkyDrones- FX Mini Pocket Drone (Color may vary): You can get this for only $9.99 here and it’s normally $29.99 at Walmart. 56% OFF Cuisinart – 15-Piece Ceramic-Coated Cookware Set – Black: You can get this for only $99.99 here and it’s normally $229.99 at Best Buy. 55% OFF The Big One Gel Memory Foam Topper: You can get this for only $39.99 here and it’s normally $89.99 at Kohls. 62% OFF Ubisoft – Starlink: Battle for Atlas – Iron Fist Weapon Pack: You can get this for only $2.99 here and it’s normally $7.99 at Best Buy. 50% OFF DOOM VFR – PlayStation 4: You can get this for only $14.99 here and it’s normally $29.99 at Best Buy. 50% OFF DOOM VFR – PlayStation 4: You can get this for only $14.99 here and it’s normally $29.99 at Amazon. 50% OFF Wolfenstein II: The New Colossus – Nintendo Switch: You can get this for only $29.99 here and it’s normally $59.99 at Amazon. 49% OFF Lite Source LS-21456PS Lantera Ii Table Lamp: You can get this for only $72.25 here and it’s normally $142.00 at Amazon. 55% OFF Kenroy Home Twigs Table Lamp Blackened Bronze: You can get this for only $71.99 here and it’s normally $162.75 at Amazon. 46% OFF Kenroy Home 21430ORB Stratton Table Lamp In With A Taupe Tapered Drum Shade, 29″, Oil Rubbed Bronze Finish: You can get this for only $50.99 here and it’s normally $95.40 at Amazon. 61% OFF Star Wars The Black Series Force FX Z6 Riot Control Baton: You can get this for only $77.18 here and it’s normally $199.99 at Amazon. 50% OFF F1 2018 Headline Edition â€“ Xbox One: You can get this for only $19.99 here and it’s normally $39.99 at Amazon. 50% OFF Kenwood – KAC 1000W Class D Digital Mono MOSFET Amplifier with Variable Low-Pass Crossover – Black/Dark silver: You can get this for only $99.99 here and it’s normally $199.99 at Best Buy. 50% OFF CyberPower – 160W Power Inverter – Black: You can get this for only $19.99 here and it’s normally $39.99 at Best Buy. 50% OFF Skullcandy – Smokin’ Buds 2 Wireless In-Ear Headphones – Black: You can get this for only $29.99 here and it’s normally $59.99 at Best Buy. 50% OFF Rocketfish – Outdoor Amplified TV Antenna – Gray: You can get this for only $49.99 here and it’s normally $99.99 at Best Buy. 50% OFF Ubisoft – Starlink: Battle for Atlas – Razor Lemay Pilot Pack: You can get this for only $2.99 here and it’s normally $5.99 at Best Buy. 44% OFF Ubisoft – Starlink: Battle for Atlas – Pulse Starship Pack: You can get this for only $9.99 here and it’s normally $17.99 at Best Buy. 50% OFF Ubisoft – Starlink: Battle for Atlas – Kharl Zeon Pilot Pack: You can get this for only $2.99 here and it’s normally $5.99 at Best Buy. 62% OFF Ubisoft – Starlink: Battle for Atlas – Shockwave Weapon Pack: You can get this for only $2.99 here and it’s normally $7.99 at Best Buy. 62% OFF Ubisoft – Starlink: Battle for Atlas – Crusher Weapon Pack: You can get this for only $2.99 here and it’s normally $7.99 at Best Buy. 66% OFF CHEFMAN – Electric Knife – Black/Stainless Steel: You can get this for only $19.99 here and it’s normally $59.99 at Best Buy. 56% OFF Star Wars Battlefront II – Xbox One: You can get this for only $12.99 here and it’s normally $29.99 at Best Buy. 50% OFF Overwatch Legendary Edition – Xbox One: You can get this for only $19.99 here and it’s normally $39.99 at Best Buy. 50% OFF Rocket League Ultimate Edition – Xbox One: You can get this for only $19.99 here and it’s normally $39.99 at Best Buy. 50% OFF Crackdown 3 – Standard Edition – Xbox One: You can get this for only $29.99 here and it’s normally $59.99 at Amazon. 50% OFF Crackdown 3 – Xbox One: You can get this for only $29.99 here and it’s normally $59.99 at Best Buy. 55% OFF Stalwart 228 Piece Rotary Tool Accessories Kit in Wooden Case: You can get this for only $13.07 here and it’s normally $29.13 at Amazon. 54% OFF Motorola Moto X4 Factory Unlocked Phone – 5.2″ Screen – 32GB – Sterling Blue (U.S. Warranty): You can get this for only $145.31 here and it’s normally $321.61 at Amazon. 50% OFF The LEGO Movie 2 Videogame – Xbox One: You can get this for only $19.99 here and it’s normally $39.99 at Best Buy. 50% OFF Kraus Soap Dispenser Satin Nickel: You can get this for only $29.95 here and it’s normally $59.95 at Amazon. 45% OFF Minecraft: PlayStation 4 Edition – PlayStation 4: You can get this for only $10.99 here and it’s normally $19.99 at Best Buy. 50% OFF Trials Rising Gold Edition – PlayStation 4: You can get this for only $19.99 here and it’s normally $39.99 at Best Buy. 50% OFF Overwatch Legendary Edition – PlayStation 4: You can get this for only $19.99 here and it’s normally $39.99 at Best Buy. 50% OFF Rocket League Ultimate Edition – PlayStation 4: You can get this for only $19.99 here and it’s normally $39.99 at Best Buy. 50% OFF The LEGO Movie 2 Videogame – PlayStation 4: You can get this for only $19.99 here and it’s normally $39.99 at Best Buy. 56% OFF XFX – AMD Radeon RX Vega 56 8GB HBM2 PCI Express 3.0 Graphics Card: You can get this for only $349.99 here and it’s normally $799.99 at Best Buy. 50% OFF LEGO The Incredibles – PlayStation 4: You can get this for only $19.99 here and it’s normally $39.99 at Best Buy. 60% OFF LEGO DC Super-Villains – Nintendo Switch: You can get this for only $19.99 here and it’s normally $49.99 at Best Buy. 50% OFF Trials Rising Gold Edition – Xbox One: You can get this for only $19.99 here and it’s normally $39.99 at Best Buy. 50% OFF The LEGO Movie 2 Videogame – Nintendo Switch: You can get this for only $19.99 here and it’s normally $39.99 at Best Buy. 42% OFF Sun Joe SPX3500 2300-PSI 1.48 GPM Brushless Induction Electric Pressure Washer, w/Brass Hose Connector: You can get this for only $140.81 here and it’s normally $244.99 at Amazon. 45% OFF 2x4basics 90190MI Custom Shed Kit with Barn Roof: You can get this for only $48.66 here and it’s normally $89.99 at Amazon. 74% OFF Samsonite Pulse Dlx Lightweight 2 Piece Hardside Set (20″/28″), Black, Exclusive to Amazon: You can get this for only $115.21 here and it’s normally $449.99 at Amazon. 42% OFF Muscle Milk Genuine Protein Shake, Vanilla Crème, 25g Protein, 11 FL OZ, 12 Count: You can get this for only $13.28 here and it’s normally $22.99 at Amazon. 77% OFF X-ACTO #1 Knife, Z Series With Safety Cap: You can get this for only $1.42 here and it’s normally $6.29 at Amazon. 59% OFF Mickey Mouse Clubhouse Cash Register: You can get this for only $8.88 here and it’s normally $22.17 at Walmart. 45% OFF Barbie Bride Doll in White & Pink Dress with Veil & Bouquet: You can get this for only $8.15 here and it’s normally $14.97 at Walmart. 82% OFF Weatherproof Vintage Cotton Merino Cashmere Crewneck Sweater: You can get this for only $11.96 here and it’s normally $70.00 at Macys. 87% OFF Tommy Hilfiger Men’s Modern-Fit Pilot Charcoal Tic Overcoat: You can get this for only $59.99 here and it’s normally $495.00 at Macys. 46% OFF Milwaukee M12 12-Volt Lithium-Ion Cordless Screwdriver/HACKZALL Combo Kit (2-Tool) with Two 1.5 Ah Batteries, Charger and Tool Bag: You can get this for only $99.00 here and it’s normally $184.37 at Home Depot. 41% OFF RYOBI 15 Amp 10 in. Sliding Miter Saw with Laser: You can get this for only $129.00 here and it’s normally $219.00 at Home Depot. 60% OFF The Big One Solid Bath Towel: You can get this for only $3.99 here and it’s normally $9.99 at Kohls.